The YMCA of the Greater Twin Cities, a leading nonprofit dedicated to strengthening communities through youth development, healthy living and social responsibility, presented Youth Thrive awards to 38 teen leaders across the metro area who have made an impact on their communities while demonstrating a commitment to the Y’s core values of caring, honesty, respect and responsibility. 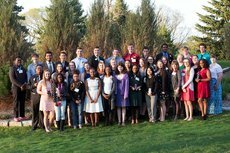 The 2017 Youth Thrive honorees strengthen the Twin Cities as volunteers, peer leaders and Y team members. Their accomplishments include facilitating community conversations around issues that affect young people, speaking to legislators at the State Capitol, providing meaningful outdoor experiences to kids as camp counselors, organizing volunteer service projects, building connections between their peers and the community, and more.